Vulnerable Democrats argue that Kavanaugh’s confirmation is not on top of most voters’ minds. WASHINGTON — The fight over Supreme Court nominee Brett Kavanaugh has been fiercely waged between the bases of both political parties, but it's those senators stuck in the middle who find themselves in the most precarious position. As the confirmation hearings for Kavanaugh begin Tuesday, the pressure is increasing on a small group of Democratic senators who face re-election in just a few weeks in states President Donald Trump won big in 2016. Republicans are thrilled that Kavanaugh's confirmation process has collided with the midterm elections, but Democrats working for these red state senators argue that while important, Kavanaugh is not the top issue for some of the most critical and persuadable voters in their states. 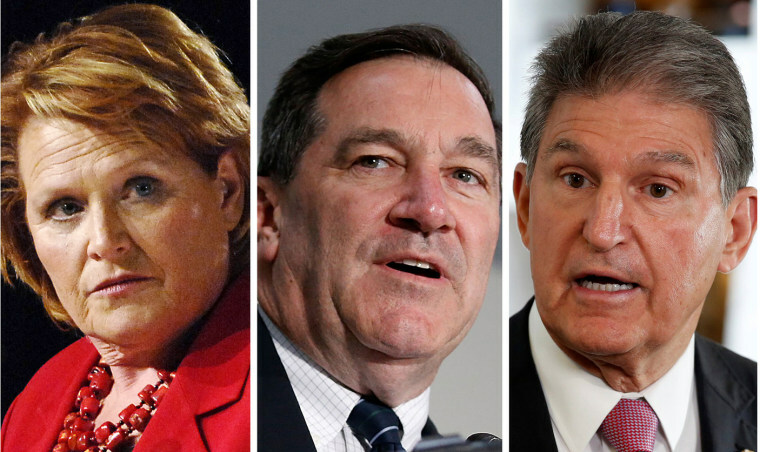 The three Democratic Senators feeling the bulk of the pressure are Joe Donnelly of Indiana, Heidi Heitkamp of North Dakota and Joe Manchin of West Virginia. All three voted for President Donald Trump’s last Supreme Court nominee, Neil Gorsuch. None of them sit on the Judiciary Committee that will conduct the hearings. Sen. Claire McCaskill, D-Mo., is another Democrat in a difficult position. Her opponent, Josh Hawley, who clerked for Justice John Roberts, opened his television ad campaign with a spot attacking McCaskill ahead of the vote on Kavanaugh. Democrats are hoping to hammer Kavanaugh with questions about abortion, the constitutionality of Obamacare provisions and his views on whether a president should be subject to investigations while in office. And advocates on both sides have spent millions of dollars on campaign ads in a handful of key states to pressure senators on their vote. All four Democratic senators are holding their judgement until the confirmation process plays out but they will have to cast a vote just weeks before the election. Senate Republicans could make the decision easier for some of those vulnerable Democrats. Without the filibuster, which was eliminated for Supreme Court nominees in the Gorsuch nomination, GOP leadership needs just a bare majority for confirmation. As long as Republicans don't suffer a defection from their ranks, any Democratic vote for Kavanaugh would not be decisive — meaning home-state considerations could be more important to their calculations than pure party loyalty. Public polling has shown Kavanaugh to be a relatively unpopular nominee, with a CNN poll from last month showing just 37 percent support for him. Although his support is higher in Indiana, West Virginia and North Dakota, according to polling from a conservative polling firm. Donnelly's campaign did not return a request for comment on Kavanaugh's impact on his race. But Democrats say that Kavanaugh is not the most important thing on voters minds. And another poll suggests just that. Forty-six percent of respondents don’t have a strong opinion of him, according to a recent Associated Press-NORC Center for Public Affairs Research poll. Still, it's weighing on the senators. One Democratic aide said that for these red state Democrats likened the Kavanaugh vote to ripping off a bandage.